In their natural habitats they eat a variety of foods including fungi, insects, bird eggs and young birds, pine nuts, and acorns, plus a wide range of other seeds. Squirrels sometime cause damage around homes and gardens, where they feed on immature and mature almonds, English and black walnuts, oranges, avocados, apples, apricots, and a variety of other plants. During ground foraging they may feed on strawberries, tomatoes, corn, and other crops. Squirrels have a habit, principally in the fall of digging holes in garden soil, or in turf, this is where they bury their nuts, acorns, or other seeds. This caching of food, which they may or may not ever retrieve raised havoc in the garden and destroys lawns. These rodents sometimes gnaw on telephone cables and may chew their way into wooden buildings or invade attics through gaps or broken vent screens. The tree squirrel can carry diseases including Tularemia and Ringworm, these diseases are transmittable to humans. These rodents are also frequently infested with fleas, mites and other ectoparasites. Bats, Beavers, Birds, Bobcats, Chipmunks, Coyotes, Flying Squirrels, Foxes, Ground Hogs, Moles, Opossums, Raccoons,Snakes, Squirrels, Skunks & More. Along with the removal of dead animals, we will disinfect and treat any unpleasant odor. Sometimes squirrels enter chimneys: and are unable to climb back out, forcing them to try to get out from a fireplace or basement ducts. Assume that the squirrel you hear scrambling in a chimney is trapped, unless you’ve got clear evidence she is able to climb back out on her own. Tree squirrels: are cute, fuzzy, and fun to watch, but humans have something of a love/hate relationship with them. We love their crazy antics—but we hate when they're raiding our birdfeeders. If you've got squirrels driving you nutty, remember that they're only doing what's natural: looking for a meal and a safe place to sleep at night. Whether you need to evict them from your attic or stop them from stealing your bird food, be patient.Florida Nuisance Trappers will come to your Home or Business and find a solution to your problem with a Warranty and at a Fair price. Squirrels living in attics: are a concern because they may gnaw on boards and electrical wires. Usually, the most serious problems come from nesting adult females. They often build their nests near openings, such as an unscreened vent or loose or rotten trim boards. The first sign of a squirrels in the attic is usually the sound of scampering during the day, as they come and go on foraging trips. 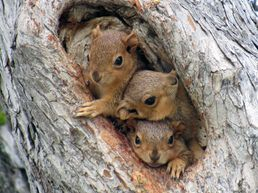 Juvenile squirrels, and sometimes adults, may fall into wall cavities and be unable to climb out, making persistent scratching noises as they try to escape, and eventually dying if they can’t. Our Animal Control Professionals know how to get rid of wildlife and offer solutions to keep wild animals out of your home or business. We have a full range of home repair services to fix animal damage and can install animal exclusion devices to prevent future animal infestations. We at Florida Nuisance Trappers always offers a Warranty on all work we perform. It is virtually impossible to keep squirrels out of fruit or nut trees because of their superb climbing and jumping ability. Sometimes if there are other unprotected fruit or nut trees available to the squirrels, you can protect the crop of a single tree by netting it as you would to exclude depredation birds. 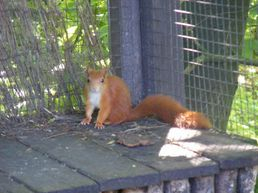 While squirrels can readily gnaw through the plastic netting, they may not persist if sufficient alternative food is easily available.Squirrels can be discouraged from digging up newly seeded or established crops by covering the rows with cage like freestanding covers made of one-inch hexagon chicken wire. If squirrels are present around bird feeders, they are usually able to raid them and steal the food. Numerous devices and methods are commercially available from specialty catalogs for physically excluding tree squirrels from feeders; some of these work better than others. Tree squirrels are amazingly clever and agile so just about any feeder is susceptible. All-metal tunnel or tube-type traps are becoming more popular for killing eastern fox tree squirrels. The design of these traps affords good protection to larger non target animals, and the trapped animal remains partially out-of-sight. The Conibear® #110 trap, a jaw-type body-gripping trap, is also an effective tree squirrel trap when set inside a trap box with the bait placed behind the trap. Several choker-type box traps are sold for removing tree squirrels. They look similar to those used for trapping pocket gophers except that the triggers are often reversed so that the bait must be pulled to activate instead of pushed, as is the case with pocket gopher traps. In fact, modifying certain wooden choker-type gopher traps can make a tree squirrel trap. 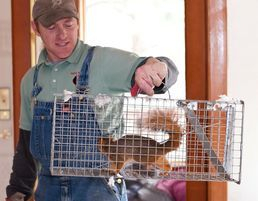 dual-trap assembly, place two box traps back-to-back and secure them to a board.Before placing traps, determine the squirrels' travel routes and locate traps in or as close to them as possible. Trees and rooftops are often good locations for placement. Locate and secure traps so that they cannot be easily dislodged. Anchor them with a wire or light chain so a predator cannot carry the trap and the catch away. Bait the traps but do not set them for several days to allow the squirrels to steal the bait and become accustomed to the trap. Once the bait is regularly eaten, set the traps, and rebate, tying the bait to the trigger with fine thread or string. Use rubber or plastic gloves when handling dead squirrels. Place dead squirrels in a plastic bag and seal to confine any ectoplasm's. 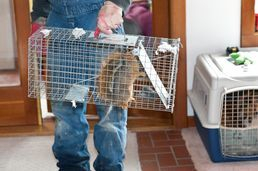 The carcasses can then be discarded in a garbage can.Sometimes ordinary rat snap traps are suggested for tree squirrels, but these are often not powerful enough to kill mature squirrels and are best not used. There are other kill traps available for squirrel-sized animals, but these are not always sold locally and may have to be ordered from a trapper supply firm.Live-catch cage traps are also available, but once caught the squirrel must be disposed of, presenting a problem for some. Remember, releasing an eastern fox tree squirrel elsewhere is illegal. Considering this problem, live-catch traps are not recommended. A kill trap is usually the most effective way to thin out the population, though new squirrels will move in to fill the void. Trapping usually becomes an ongoing process once the neighborhood is populated with tree squirrels. To modify a gopher trap, lengthen the trigger slot with a rattail file so the trigger can swing unhindered and the squirrel can pass beneath the unset trap. Remove the back and replace it with 1/4-inch mesh hardware cloth, which allows the squirrels to see the bait from both ends but prevents access without passing through the trap. Squirrels are usually not harmful when they are living in your trees, but they can be very destructive and a health hazard once they invade your home. Squirrels can squeeze through small holes or gaps, or chew their way in, and will commonly set up their nests in your walls and attic. These critters are attracted to secure and warm places to build their nests and have their young. Squirrels build their nests out of material such as dried twigs and leaves, scraps of cloth and hair which makes them flammable when they are in your walls. This is especially true considering that squirrels may also chew through your electrical wiring which can start house fires. Squirrels can also die in hard to reach a place which is unsanitary and leaves a smell that will permeate everything in your house. Like other rodents, squirrels have four front teeth that never stop growing so they don't wear down from the constant gnawing. Tree squirrels are the types most commonly recognized, often seen gracefully scampering and leaping from branch to branch. Other species are ground squirrels that live in burrow or tunnel systems, where some hibernate during the winter season. Squirrels communicate: with each other through various vocalisations and scent marking. 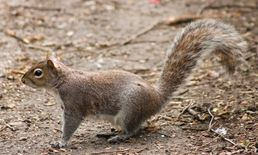 They also use their tails as a signaling device, twitching it when uneasy to alert other squirrels of potential danger. Same Day Service. Free Estimates. 24 Hour Service. Licensed. Once the type of nuisance animals, pests, or rodents that are nesting, making noise, or chewing on your wiring in your attic or crawlspace has been identified - whether it be squirrels, raccoons, rats, bats, birds or bees – they will be trapped and removed from your attic or crawlspace. Florida Nuisance Trappers can then remove the insulation that might be damaged or contaminated with droppings, urine and odors in a safe and clean way! Do squirrels live in houses? Squirrels build their own "houses" for summer use, and they live in cavities in large trees during cold winter months to keep them warm. They are mammals, so they need to protect themselves from both cold and hot weather just like people do. However, did you mean, "do squirrels live in people houses?" Yes, they sometimes do find a way to climb into an attic or empty room. They love being protected from natural enemies such as hawks and cats and even snakes. And they enjoy the snug warmth, too. Squirrels can be pretty noisy in an attic -- so if you don't want squirrels in your attic, prevention is the best solution. Making sure that small holes are reparied with metal plates, and that scrap food is removed will encourage squirrels to go find their natural home space and natural food sources. Use metal whenever possible -- avoid plastic, PVC and wood in squirrel territory. You might want to place pet food dishes, garbage cans and bird feeders carefully -- they look like a holiday dinner to a hungry squirrel! It's a lot easier than foraging for nuts and fruit, so they will visit these human diners every day once they are discovered. There are over 265 species of squirrel worldwide. The smallest is the African pygmy squirrel which is tiny at around 10 cm long, whereas the largest, the Indian giant squirrel is a massive three feet long. When a squirrel is scared and feels that it is in danger, it will at first remain motionless. If it is on the ground, it will run to a nearby tree and climb to safety, and if it is already in a tree it will circle the trunk and press up against the bark tightly with its body. In colder regions such as the UK, squirrels plan ahead in order to survive the challenging winter months. They store nuts and seeds at various locations and return to them throughout the winter to maintain their energy levels when food is scarce. Squirrels tend to run in erratic paths. This is intended to deceive potential predators as to its chosen direction so that it may escape. Tree-dwelling squirrels such as the grey squirrel build dreys (similar to bird’s nests) made of twigs high in trees. They are about the size of a football and are lined with grass, bark, moss and feathers for added comfort and insulation. Squirrels communicate with each other through various vocalisations and scent marking. They also use their tails as a signalling device, twitching it when uneasy to alert other squirrels of potential danger. There are 44 species of ‘flying squirrel’. Rather than actually flying, these species glide using a membrane which stretches from their wrists to their ankles. It allows squirrels to glide naturally like humans do with the aid of a parachute. The squirrel is the Native American symbol for preparation, trust and thriftiness.